Thank you for choosing Ford. We recommend that you take some time to get to know your vehicle by reading this manual. The more that you know about it, the greater the safety and pleasure you will get from driving it. : Always drive with due care and attention when using and operating the controls and features on your vehicle. : This manual describes product features and options available throughout the range of available models, sometimes even before they are generally available. It may describe options not fitted to your vehicle. : Some of the illustrations in this manual may be used for different models, so may appear different to you on your vehicle. However, the essential information in the illustrations is always correct. : Always use and operate your vehicle in line with all applicable laws and regulations. : Pass on this manual when selling your vehicle. It is an integral part of the vehicle. This manual may qualify the location of a component as left-hand side or right-hand side. The side is determined when facing forward in the seat. the environment. Correct vehicle usage and the authorized disposal of waste, cleaning and lubrication materials are significant steps toward this aim. : You risk death or serious injury to yourself and others if you do not follow the instruction highlighted by the warning symbol. Service data recorders in your vehicle are capable of collecting and storing diagnostic information about your vehicle. 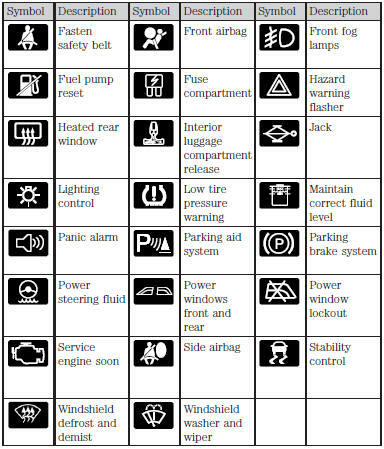 This potentially includes information about the performance or status of various systems and modules in the vehicle, such as engine, throttle, steering or brake systems. In order to properly diagnose and service your vehicle, Ford Motor Company, Ford of Canada, and service and repair facilities may access or share among them vehicle diagnostic information received through a direct connection to your vehicle when diagnosing or servicing your vehicle. Additionally, when your vehicle is in for service or repair, Ford Motor Company, Ford of Canada, and service and repair facilities may access or share among them data for vehicle improvement purposes. 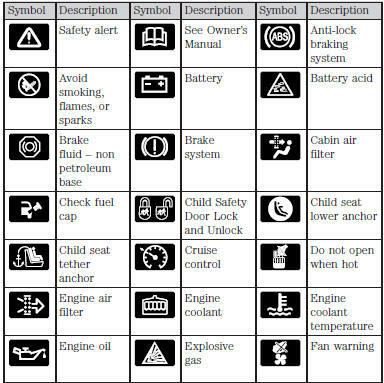 For U.S. only (if equipped), if you choose to use the SYNC® Vehicle Health Report, you consent that certain diagnostic information may also be accessed electronically by Ford Motor Company and Ford authorized service facilities, and that the diagnostic information may be used for any purpose. See the SYNC® chapter for more information. • How fast the vehicle was travelling; • Where the driver was positioning the steering wheel. Note: EDR data is recorded by your vehicle only if a non-trivial crash situation occurs; no data is recorded by the EDR under normal driving conditions and no personal data or information (e.g., name, gender, age, and crash location) is recorded (see limitations regarding 911 Assist and Traffic, Directions and Information privacy below). However, parties, such as law enforcement, could combine the EDR data with the type of personally identifying data routinely acquired during a crash investigation. To read data recorded by an EDR, special equipment is required, and access to the vehicle or the EDR is needed. In addition to the vehicle manufacturer, other parties, such as law enforcement, that have such special equipment, can read the information if they have access to the vehicle or the EDR. Ford Motor Company and Ford of Canada do not access event data recorder information without obtaining consent, unless pursuant to court order or where required by law enforcement, other government authorities or other third parties acting with lawful authority. Other parties may seek to access the information independently of Ford Motor Company and Ford of Canada. Note: Including to the extent that any law pertaining to Event Data Recorders applies to SYNC® or its features, please note the following: Once 911 Assist (if equipped) is enabled (set ON), 911 Assist may, through any paired and connected cell phone, disclose to emergency services that the vehicle has been in a crash involving the deployment of an airbag or, in certain vehicles, the activation of the fuel pump shut-off. Certain versions or updates to 911 Assist may also be capable of being used to electronically or verbally provide to 911 operators the vehicle location (such as latitude and longitude), and/or other details about the vehicle or crash or personal information about the occupants to assist 911 operators to provide the most appropriate emergency services. If you do not want to disclose this information, do not activate the 911 Assist feature. See your SYNC® chapter for more information. Additionally, when you connect to Traffic, Directions and Information (if equipped, U.S. only), the service uses GPS technology and advanced vehicle sensors to collect the vehicle’s current location, travel direction, and speed (“vehicle travel information”), only to help provide you with the directions, traffic reports, or business searches that you request. If you do not want Ford or its vendors to receive this information, do not activate the service. Ford Motor Company and the vendors it uses to provide you with this information do not store your vehicle travel information. For more information, see Traffic, Directions and Information, Terms and Conditions. See your SYNC® chapter for more information. : Some constituents of engine exhaust, certain vehicle components, certain fluids contained in vehicles and certain products of component wear contain or emit chemicals known to the State of California to cause cancer and birth defects or other reproductive harm. : Certain components in your vehicle, such as airbag modules, safety belt pretensioners, and remote control batteries, may contain perchlorate material. Special handling may apply for service or vehicle end of life disposal. See www.dtsc.ca.gov/hazardouswaste/perchlorate for more information. Ford Credit offers a full range of financing and lease plans to help you acquire your vehicle. If you have financed or leased your vehicle through Ford Credit, thank you for your business. For your convenience, we offer a number of ways to contact us, as well as help manage your account. Phone: 1-800-727-7000 For more information regarding Ford Credit, as well as access to Account Manager, please go to www.fordcredit.com. Your vehicle has been built to the highest standards using quality parts. We recommend that you demand the use of genuine Ford and Motorcraft parts whenever your vehicle requires scheduled maintenance or repair. You can clearly identify genuine Ford and Motorcraft parts by looking for the Ford, FoMoCo or Motorcraft branding on the parts or their packaging. One of the best ways for you to make sure that your vehicle provides years of service is to have it maintained in line with our recommendations using parts that conform to the specifications detailed in this owner’s manual. Genuine Ford and Motorcraft parts meet or exceed these specifications. We hope that you never experience a collision, but accidents do happen. Genuine Ford replacement collision parts meet our stringent requirements for fit, finish, structural integrity, corrosion protection and dent resistance. During vehicle development, we validate that these parts deliver the intended level of protection as a whole system. A great way to know for sure you are getting this level of protection is to use genuine Ford replacement collision parts. For a detailed description of what is covered and what is not covered by your vehicle’s New Vehicle Limited Warranty, see the warranty information that is provided to you along with your owner’s manual. For your added safety, your vehicle is fitted with sophisticated electronic controls. : Please read the Supplementary Restraints System chapter. Failure to follow the specific warnings and instructions could result in personal injury. : Front seat mounted rear-facing child or infant seats should NEVER be placed in front of an active passenger airbag. : Driving while distracted can result in loss of vehicle control, crash and injury. We strongly recommend that you use extreme caution when using any device that may take your focus off the road. Your primary responsibility is the safe operation of your vehicle. We recommend against the use of any handheld device while driving and encourage the use of voice-operated systems when possible. For your particular global region, your vehicle may be equipped with features and options that are different from the features and options that are described in this owner’s manual. A market unique supplement may be supplied that complements this book. By referring to the market unique supplement, if provided, you can properly identify those features, recommendations and specifications that are unique to your vehicle. This owner’s manual is written primarily for the U.S. and Canadian Markets. Features or equipment listed as standard may be different on units built for Export. See this owner’s manual for all other required information and warnings.